We swaddle and cradle our children for a split second, and then we do the hard work of slowly sending them off. So that’s why I took a step back, and really looked at my oldest son one day, and wrote this … a letter to a 10-year-old — still very much a kid, but oh my heart, not for long. I remember the day we drove you home – all five pounds of you, swaddled snug in a hospital blanket. You smelled so sweet. It feels like it was yesterday. I see you now, wearing green neon laces on shoes nearly the same size as mine, with a frame that can knock me over in a single playful wrestle … and I can’t believe how much you’ve grown. You began as this unbelievably small bundle, and we made an unbelievably big deal about you. Every little thing you did, every glimmer of wonder in your eyes, every grunt and cry — we took it all in, our fingers never too far from the shutter button. You opened your eyes. Click. You screamed your head off in the bathtub and then nestled your tiny exhausted body in our arms. Click. Then came your very first smile, priceless. Your sweet first utterances of “mama” and “dada.” You rolled over, sat, crawled, and took that momentous step across the living room, bravely into preschool, and into each new school year. I lost sleep and aged light years because of you — never had I experienced a life so dependent on me, 24/7. It was terrifying yet beautiful. Your newness was miraculous. Why? Because the simplest things amazed you — a sand pail filled with water, dusty sidewalk chalk, bubbles sailing across the grass. Things I took for granted were your delights. Then came your younger brother, your baby sister and their little-ness became big deals too — making you seem not so little in comparison. Somewhere along the way, your cheeks deflated, your permanent teeth came in, your shoulders broadened, and now you want to swipe gel in your hair like dad. Now you need braces. And these days you simply call me “mom,” and your burps are not so welcomed, and your smell, especially after school, is not so sweet. There are a lot of growing pains for sure, and God help us, much more to come. So hear this my child, I’m thankful for all of your seasons – each one is a gift, none less miraculous than the one before. I’m sorry we may not ooh and ahh as much over every little thing you do, and now expect so much more from you than spit up and a toothless grin. It’s only because there’s a world out there, that you slowly and surely need to get ready to tackle … but nonetheless, you are still a miracle. As you become less of an extension of us and more of your own person, keep up the hard work of growing up. We’ll be praying hard for you, very hard, for grace to cover you and most definitely us. 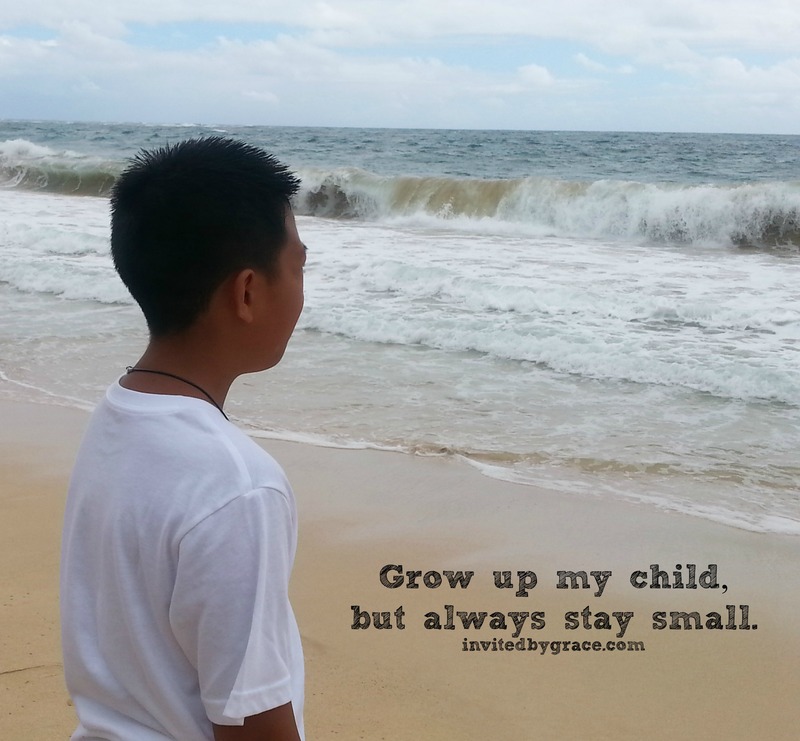 Grow up my child, but always stay small. Stay small enough to know the wonder of a big God who loves you as a child. Stay small enough to delight in ordinary graces that happen everyday. One day, to my heart’s sadness, you will be too big for my arms. But never outgrow the safety of God’s hold on your life. Because as you’re already learning, life will bring harder things than fly away balloons and dropped ice cream cones. So look for bubbles that sail across the grass from time to time. For even when your shoe size surpasses mine, you will always, forever be my child and His.